(APN) ATLANTA — On June 21, 2017, the City Council of Atlanta voted, as part of the approval of next fiscal year’s budget, to raise the minimum wage for workers employed by the City of Atlanta from to $10.10 to $15 an hour over the next two fiscal years. The raise does not cover people working in the City of Atlanta who do not work for the City, as the State Legislature previously banned Georgia cities from setting its own citywide minimum wage. Starting on July 01, 2017 the City employee minimum wage will increase to thirteen dollars an hour; will increase another dollar to fourteen dollars on July 01, 2018; and finally to fifteen dollars an hour on July 01, 2019. In addition, workers in all departments at grades 19 and above making less than 150,000 dollars per year will receive a three percent salary increase. The City of Atlanta worked with Atlanta Jobs with Justice, a local non-profit organization, in setting the new minimum wage, which affects 360 employees immediately and will affect more than 850 employees once the full increase is phased in. The City will also spend two million dollars in general fund dollars to establish a three-tier payment structure for recruits and firefighters within the Atlanta Fire Rescue Department (AFRD) bringing the starting salary for recruits to 40,000 dollars annually. The Atlanta Police Department (APD) and AFRD will offer a 5,000 dollar one-time bonus for new hires with prior military service and the honorable discharge or continued active service through the reserves. “The fight for $15 came to Atlanta through our organization, supporting fast food workers fighting for a livable wage. The courage of those workers told us that Georgia workers everywhere were ready for $15. We are excited to see Atlanta restore its promise to living wages, because more than 1,000 individuals will be pulled out of poverty from this action,” Shannan Reaze, Executive Director of Atlanta Jobs with Justice, said in a statement. Georgia’s minimum wage is still only $5.15 an hour, which is below the federal minimum wage of $7.25 an hour. The State of Georgia in 2005 passed a law that prevents any city or county in the State of Georgia from raising the minimum wage for the general population. “Georgia was one of the first to pass this law, but it spread like wildfire throughout the country and is probably one of those American Legislative Exchange Council (ALEC)-backed laws,” Neil Sardana, Coalition Coordinator, Atlanta Jobs with Justice, told Atlanta Progressive News. Georgia’s wage preemption law “does not preclude any employer in the State of Georgia from setting their own wages. The City of Atlanta being an employer can set fifteen dollars an hour and they did it through an ordinance,” Sardana said. No one can live on the State’s minimum wage of $5.15 an hour, except maybe in a homeless shelter and that is where some of the working poor live in Atlanta. Last year, State Sen. Vincent Fort (D-Atlanta) introduced SB 28 last year to increase the minimum wage in Georgia from $5.15 and hour to fifteen dollars an hour. It was referred to the Senate Committee on Insurance and Labor where it is stalled but still active for next year. 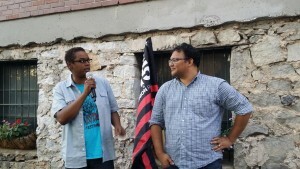 “Even though this fight is just City of Atlanta workers now, but it’s indicative of the bigger fight to make sure what is due to us workers is coming down the pipe to us… 300,000 workers are under fifteen dollars an hour in Fulton County alone,” Reaze said at a celebration party held by labor activists. “I want to thank Finance Chairman Howard Shook (District 7), my colleagues on Council, the Human Resources Department, Finance Department, the Mayor’s Office, the unions, employees, and the public for all of their input and effort to make this budget possible,” Councilman Dickens said in a statement. “I am proud that the City of Atlanta is continuing its rich history of being a model employer in our state. Atlanta employees deserve to be paid a living wage and today’s budget actions and amendments prove that the City will take care of the employees that take care of the people”, Dickens said. we want to thank city of Atlanta taxpayers as well as educate the people about how many workers their are. We trust that the new money will be earned, go to necessities, family, other as well as be saved for emergencies.What laws do other cities have?? So what can organized labor celebrate this Labor Day? Though union participation is flagging, recent battles over fast food and Walmart workers, and a $ 15 – per – hour minimum wage, are coming to the forefront — a development that has some longtime labor experts floored.